Till now one could only display one name on Facbook profile page. 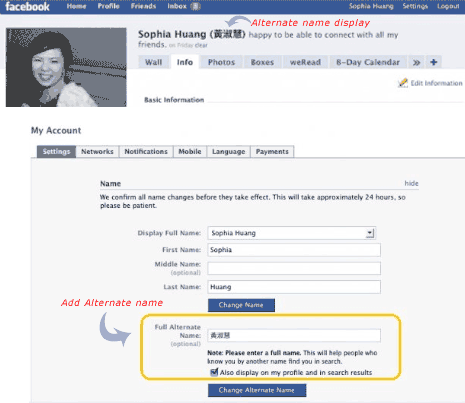 Well, not any more – now you can show alternate name to your existing name on the Facebook profile page using new full alternate name feature. As pointed by Facebook Blog, some users have multiple names (for example: one name in Chinese and other name in English). Now you can connect with more friends who know either your name by displaying both primary and alternate names on your Facebook profile page. The alternate name will be shown in parenthesis alongside your primary name. To enter alternate name in your Facebook profile, goto account settings page and check for alternate name option at the bottom. This feature for sure help Facebook users to connect better with more friends around the world, what say? WOW! That’s great, it means now along with one name we can add altername name also on facebook, thanks for snapshot. How can I get those chinese characters?